I stopped by my local Lego store the other day and grabbed a new catalog. 75145 Eclipse Fighter. 363 Pieces for $29.99. A Star Wars set with an $0.08 Price per Piece. Nice! 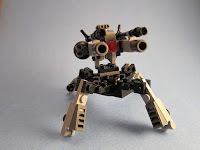 31049 Twin Spin Helicopter. 326 Pieces for $29.99. Less pieces than the Star Wars set but no minifigs to discard. Plenty of neat pieces and multiple color selections. 70600 Ninja Bike Chase. 231 Pieces for $19.99. Plenty of useful pieces in Black, Dark Blay, and, Red. 70602 Jay's Elemental Dragon. 350 Pieces for $29.99. Some good parts in Black, Dark Blay, and Light Blay, and some interesting stuff in Trans-Light Blue. 41172 Water Dragon Adventures. 212 Pieces for $19.99. Interesting parts in Light Blay and Medium Azure. Here's a quick review for the middle of the week. Bag. I paid $3.99 for this at Toys'R'Us, for a $0.09 Price per Piece. Parts. 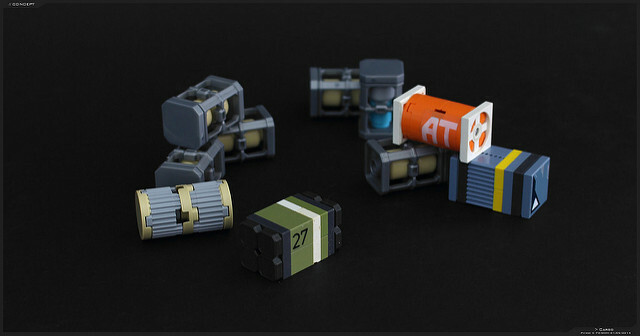 A wide range of pieces but not a high quantity of any one single part. Plenty of Slopes and Plates, some Clip Plates, a couple of Bar Plates, some Robot Arms, a few Tiles, Minifig Handcuffs, a Minifig Radio, and a couple of other pieces. Score: +10 (A-). It just needed four more pieces to get the max score. After a discussion recently about entry costs to MFZ, I decided to revisit my T.U.R.D. 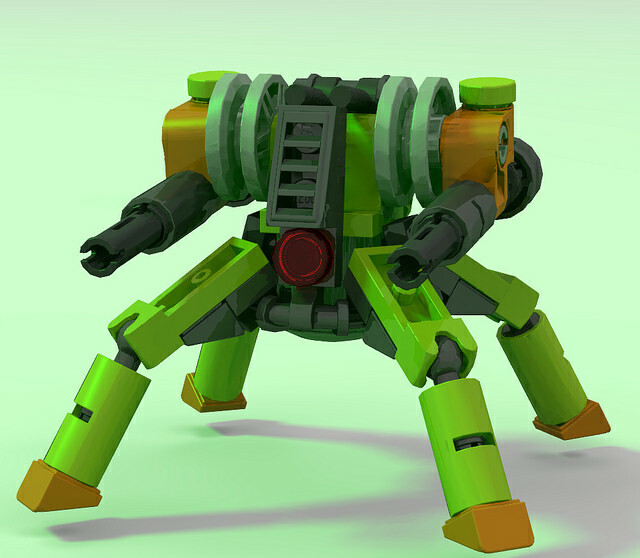 Bot design and see how much it would cost to build the core via Lego Pick-A-Brick. Here's the original post for reference. I've built a lot of these since that post, it has also been named by Joel Raynor on the MFZ Facebook page. As you can see, each one is slightly different. Format = Part Number, Description, Quantity, Colors, Cost. Since the 2x2 Towball Plate isn't available in PaB, we'll have to substitute a few pieces. So that gives us a base price of $5.25 for each "torso". You're on your own for Attachments as they can take so many different forms. 60478 Plate, Mod. 1x2 w/Handle on End (Closed Ends) (x4) Black, Blue, Dark Bluish Grey, Light Bluish Grey, Red, Reddish Brown, Tan, White, Yellow. You could also substitute the following part. 18649 Plate, Mod. 1x2 w/Handles on Ends (x2) Black, Light Bluish Grey. I hope you try to build a few and have as much fun as I have. Box. MSRP was $14.99 for a $0.10 Price per Piece. Parts 1. Lots of Technic Lift Bars, several Technic Knob Wheels, some Hero Factory Armor, some Hero Factory Wide Curved Blade Weapons, some Axles, and the Skull Spider Mask. Score: +15 (A). While there are some interesting parts in this set, I don't think it's a good starting point for Frames. Only three of us got together to game this time. We were at the Whiz in Westborogh, MA again on June 12th. I managed to keep pretty decent notes this time around, but I still missed a few things. Events of Turn 1 (DDC@11): Since I was forced to act first by virtue of being last, I made a push for A Team's unguarded Station. My Red frame hit A Team's Yellow frame for 3 damage. Her Lime frame hits my Brown frame for 1. Occam's Spork's Shoot & Scoot frame hits my Blue frame for 1, his Recon by Fire frame hits it for 3. Events of Turn 2 (DDC@9): A Team's Yellow frame hits my Brown frame for 1. In retaliation my Red frame kills her Yellow frame and I seize her unguarded Station. Occam's Spork's Shoot & Scoot frame kills my Blue frame. Events of Turn 3 (DDC@7): Occam's Spork's Melee Sprinter frame hits A Team's Purple frame for 1. He also seizes her other Station. In my push to grab Stations I left one of mine unguarded. A Team seizes it. Events of Turn 4 (DDC@4): My Red frame hits A Team's Lime frame for 1. A Team's Purple Frame takes 5 damage and is destroyed by Occam's Spork's Melee Sprinter frame. A Team's Orange frame hits Occam's Spork's Shoot & Scoot frame for 1. Events of Turn 5 (DDC@1): Occam's Spork's Melee Sprinter moves off A Team's Station to engage my Pink frame. It does no damage and I leap over it to seize the now unguarded Station. Occam's Spork's Shoot & Scoot frame destroys my Purple frame allowing him to take my Station. He then moves it out to engage A Team's Orange frame which then leapfrogs over the Shoot & Scoot frame, shoots it for 3 damage, and seizes the Station. My Brown frame hits A Team's Lime frame for 1 in a last ditch attempt to lower her score. The Doomsday Clock ticks down to zero. End of Turn 5 pictures. We had a new Archetype debut in this game, the Melee Sprinter. I took a few aftermath pictures but they were crappy so I deleted them. I didn't play as well as I could have. I split my attention on two fronts and that hampered me. We actually managed to do damage to the "Evil Stargate"! 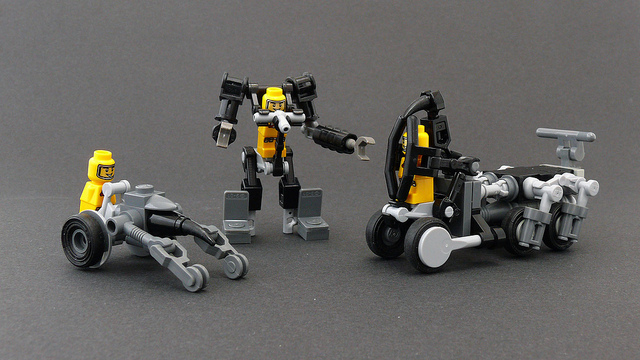 Lego is marking down a number of sets that are pretty decent for MFZ. Here's a list of what I saw and found interesting in my local store. 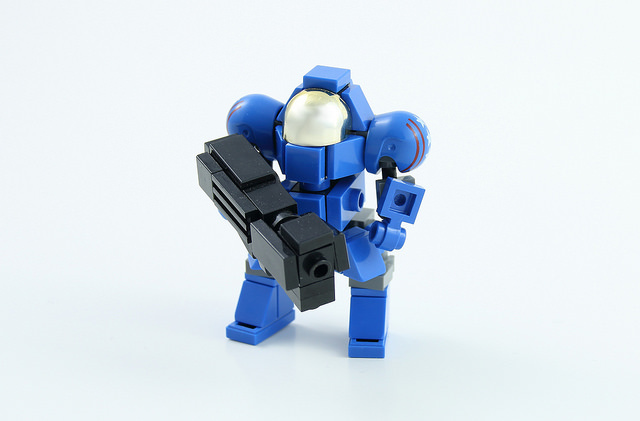 There are probably more on the Lego website, so check that out too. Target has a $10 off $50 coupon for a Lego City, Superheroes, or Friends purchase. Toys'R'Us is doing a 2 for $20 for all "Toys to Life" single figure sets. I'm not sure how this impacts Lego Dimensions sets. They are also doing 20% off all Speed Champions sets. 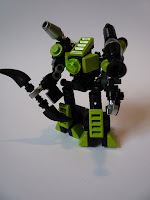 Taking a break from the Series 7 Mixels for the moment let's take a look at a recent polybag. Bag. I paid $3.99 for this at Toys'R'Us, for a $0.16 Price per Piece. Parts. There's a couple of the Mod. Plate w/Arm Up, a Cone, a 1x2 Cheese Slope, some Technic bits, Wheels and Rims, and then there's the Motorcycle Frame and Cover. Score: -15 (C). Honestly, I bought this set just for the Captain America minifig. It's Friday! 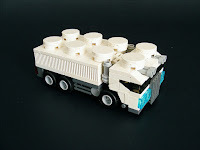 Enjoy some cool creations from Flickr..
Havetsby Vehicles by Johŋ. These are some really neat microscale vehicles. Radow Blesk by Vinny Turbo. Who doesn't like sportscars? add some real character to any gaming table. are awesome and quite obviously 6P scale. 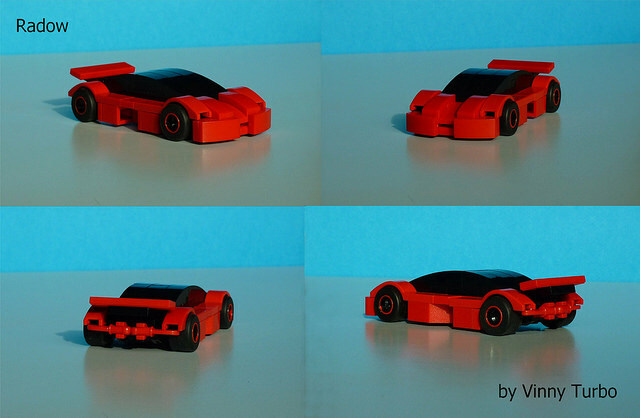 Wheels of Plastic by Cole Blaq. This looks fantastic but wouldn't stand up to table use. It also looks like it would absorb more than five hits and be way too dense as terrain. It has some interesting techniques though. I'm feeling lazy this week so here's more pictures of mecha. 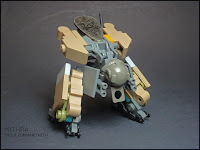 not a mech, but still awesome looking. 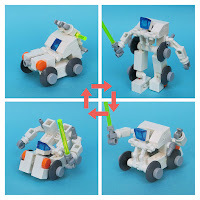 LEGO: Micro Transform Robot by Umamen. 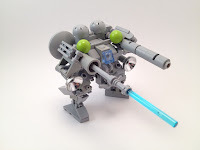 This is a really well done build. 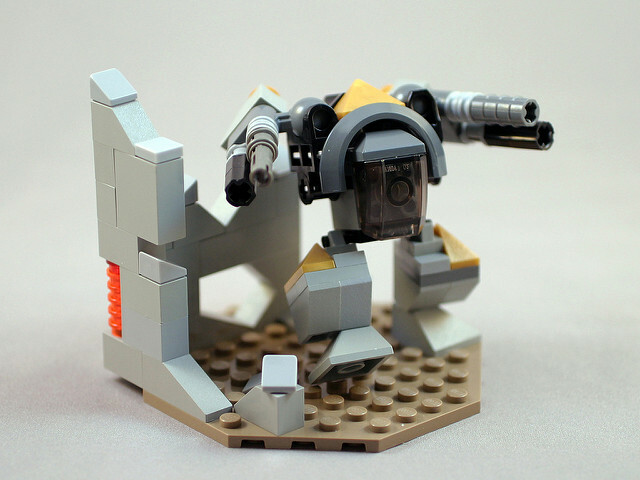 MD-08 by ferrelferret. Big shoulders and a giant shield. I like it! 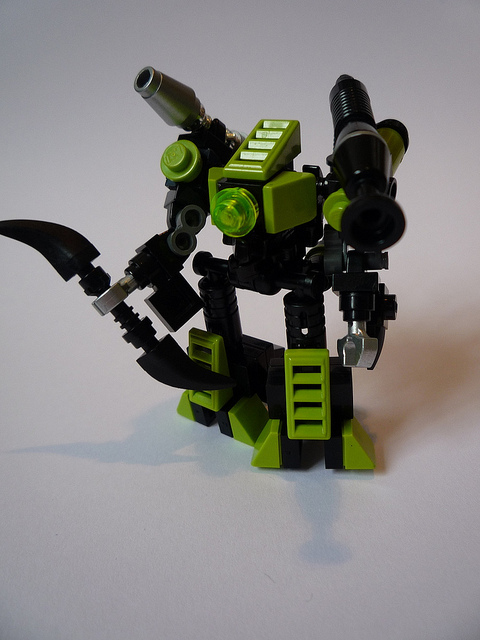 Built for MFZ but no picture downloads. Mini Mech 1 by Bers Bers. This is a neat build, full of interesting greebles. picture but, I really like the looks of this one. Toys'R'Us is running a 20% off sale on Jurassic World and Minecraft Lego sets. It looks like they really jacked up the prices on the Jurassic World sets. Somebody remind me to check next week when the sales is over. Target is running a 20% off sale on TMNT Mega Bloks sets. I can't find a better link because Target's website looks to be optimized for smartphones.